If you're after an all-in-one but don't want to settle for an average looking machine then this Asus effort should make it onto your shortlist despite some shortcomings. Like many of us, you are likely to look at the Zen AiO S twice to make sure that it is not a newer iteration of Apple's much-applauded iMac. The latter set the standard when it came to all-in-one PC design and has enjoyed sustained growth despite its much higher price. 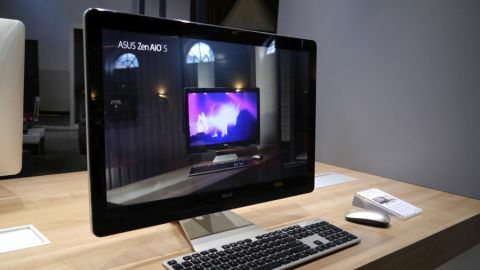 The Zen AiO S was unveiled at Computex in Taipei just over two months ago and caused some controversy given how similar it is to Apple's all-in-one. That was compounded by the fact that both Asus and Apple share the same original design manufacturer, making the Zen AiO S and the iMac potential assembly line siblings. The 23.8-inch Z240IC is the model we looked at today. There's a smaller version, the 21.5-inch Z220IC which has a smaller display and a lesser specification overall. Both however share the same aluminium unibody we're used to, one which tapers to edges only 6mm thick. That said, compared to the iMac, the bezel is far thicker and there are brush lines at the back as well. These, Asus says, are inspired by the Zen philosophy with concentric circles on the front fascia. There's also an integrated matching stand, and the display is covered by a layer of edge-to-edge glass that may prove to be too much of a distraction (especially if you choose the touch display option). Glare and fingerprints may well become major issues if you plan to use this machine in an office environment. Apple, of course, doesn't do touchscreens on any of its non-mobile devices. Round the back of the Zen you'll find a card reader, one USB 3.1 (10Gbps) Type-C port, four USB 3.0 ports, an Ethernet port, microphone and headphone sockets and a card reader. Oddly enough, there are also two HDMI out ports (but no DisplayPort) and a USB 2.0 connector – as to why Asus engineers made those choices? No one knows. Asus has used cutting edge components from Intel and Nvidia to build the Zen AiO S and while we don't have benchmarks to prove it, it is likely that this desktop will be blazingly fast. The couple of minutes we had to play with it left us with a very good impression, even when playing back sample 4K videos. Sixth-generation Skylake processors (either Core i7-6700T, i5-6400T or i3-6100T) have been paired with Nvidia's Maxwell-based GeForce GTX 960M (2GB or 4GB SKUs) or the GTX 950M (1GB or 2GB models). The company didn't scrimp on other components as well: there's up to 32GB of DDR4 memory, up to a whopping four 512GB M.2 PCIe SSDs, 802.11ac Wi-Fi, and Bluetooth 4.0. It's the same story when it comes to audio with a staggering six speakers built in (two 4W woofers and four 2W speakers to be precise). We couldn't get them to play but given the size of this PC, it is likely that the sound quality will be superior to your typical laptop. The more exciting news comes when we turn to the visual side of the equation. The larger, 23.6-inch AiO has a 4K display, which is about as good as it gets for this screen diagonal (Apple's 27-inch iMac has a 5K resolution). Although the monitor was unlikely to have been calibrated out of the box, the colours were well rendered with little trace of bleed or artefacts even when viewing high contrast, saturated sample 4K videos. Then there's the 2-megapixel RealSense camera from Intel that Asus promises will add "futuristic interactive capabilities", especially when bundled with Windows 10. We couldn't test these claims though. Not everything wowed us, however. For a start, the keyboard and the mouse had a decidedly plasticky feel, as if they were almost like an afterthought, not something we expect from a premium product. Sure, they serve their purpose in practical terms, but it just seems like an odd pairing. Asus also bundled a few of its own applications (HomeCloud, PC Link, Share Link and SyncUp apps) that while useful, end up, more often than not, being just a waste of space for the user, and a waste of resources for the developer. Note that the smaller Z220IC has a full HD resolution and no RealSense camera. The suggested retail prices in the Eurozone have been set at €1500 (about £1100, $1700, AU$2500) for the bigger model and €1100 (about £800, $1250, AU$1800) for the smaller machine with availability from October 2015. These prices are probably higher than expected, putting them near Apple's iMac range, but it's a fair bet that they'll come down fairly quickly. Barring any potential snafus coming from Apple, the Asus Zen AiO PC is likely to be a critical success. Whether that translates into a commercial success remains to be seen. Other than the bloatware and the average quality keyboard and mouse, this represents a very decent first try from Asus.